You can fall in love with pasta again because there is a healthier pasta you can feed you and your family. 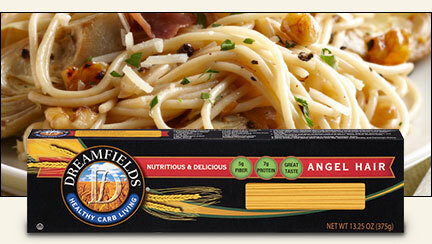 Dreamfields Healthy Pasta is made from durum wheat which is grown and produced in the America heartland. They take the wheat and mill it into semolina. Their pasta contains inulin, a prebiotic fiber from chicory root, which aids in digestion. A serving of Dreamfields healthy pasta has five grams of fiber and seven grams of plant protein. Since I am crazy for their pasta, I want to give it away to one lucky reader. One fortunate reader will win an assortment of pasta from spaghetti, elbow, rotini to angel hair. All you need to do is enter below. The contest is open to the United States and Canadian residents only. It ends October 31st so enter before it is no more. We eat pasta as a main dish a few times a month, and as a side dish weekly. We do eat Dreamfields as well. I like the recipe they have for chicken taco pasta. I definitely do. Don't think I've tried their pasta before. I love pasta. Never tried Dreamfield's before. We love pasts in our home. I have never tried Dreamfield's pasta products. I love pasta and would love to try the Dreamfields pasta! We eat pasta often. I have had Dreamfield's in the past and it is really good. I would like to make the Blackened Shrimp Pasta. We eat plenty of pasta and have tried dreamfield! It is pretty good. Yes, we eat Pasta, and Dreamfields is a favorite of ours! I would love to try the Chicken & Mushroom Spaghetti in Spicy Red Wine Tomato Sauce. We do eat pasta but I'd like to find a healthier one for us. I've not tried this brand before! We love pasta.We eat it regularly,but have not tried this kind/brand yet. We're big pasta eaters at our house, and i'm always looking for ways to make it healthier. I haven't tried this brand, but would love the chance to! Yes, we eat pasta occasionally. We are pasta lovers in this house. I believe I might have tried dream-fields pasta years ago. Elbows with Garlic Cream Sauce, Sun-Dried Tomatoes and Basil. Yes, we love dreamfields pasta! I eat pasta nearly every day! I have tried Dreamfields pasta in the past and it was great! I make a chicken pasta salad. I would love to try the Cheesy Pasta with Chicken & Broccoli recipe! As a family of runners pasta is a staple in our home. I've never tried Dreamfields, it sounds delicious! I have a fair amount of butternut squash in my garden and would love to use it to make the Butternut Squash Bolognese! I like Pasta with a little drizzle of Italian Dressing on it for snacks, as well as main meals. I do eat pasta and have tried this brand. I love pasta. I've tried Dreamfields -- it's delicious! We all love pasta, but I don't think I have ever tried this brand. I eat pasta. But have never had this brand. I eat pasta all of the time. Dreamfields is great & they have frequent coupons available for their products. We eat a lot of pasta, I love to cook pasta! I've never tried Dreamfields before. We really love a variety of pasta but never tried or heard of Dream fields before. We eat pasta 2 - 3 times a week! Alfredo is one of my favourites, but we've been making a lot of lasagna lately. I've never tried Dreamfields pasta before. I loooove pasta, never tried this though. I eat pasta occasionally, but I have never tried Dreamfield brand. I would like to try the Spaghetti Oriental recipe. I like Asian flavours. I love pasta but I've never tried Dreamfield's before. I like pasta but I have never heard of this brand. I LOVE pasta, it's my favorite food! I have never tried Dreamfields pasta, but I'd be open to it because it sounds great. I'll eat all kinds of pasta! I eat pasta quite a bit but I've never heard of Dreamfield's. I love pasta but I haven't tried Dreamfield's pasta. It's time to now! I eat pasta all the time but I have never tried this brand! I want to try the Angel Hair & Tomato Toss recipe. We eat pasta several times a week and I've never tried Dreamfields. i do eat pasta often. I make several types for the family. I’m pretty sure I’ve tried this brand. I eat pasta quite a bit but have never tried Dreamfield's pasta. I love pasta, but I have never tried this brand. The blackened shrimp pasta looks so yummy! Love pasta. I've never tried Dreamfield's before. We eat pasta weekly. I have not had Dreamfield's in the past but would like to try it. Do I eat pasta? I had a bowl of it for lunch today. Now I need to try Dreamfields. Yes I eat pasta. Ive never tried Dreamfields, but I would like too! Yes I eat pasta, we love it! and I have had Dreamfields and love it! I love pasta and eat it often. I have not tried Dreamfields yet. Love pasta, but have not tried Dreamfields yet! I love pasta but try not to eat it too often. I haven't tried Dreamfields by would really like to. We don't eat as much pasta as we used to. I've never tried Dreamfields. I'd love to try the Penne Rigate! I eat pasta all of the time, but I've never eaten dreamfields pasta. I love pasta and I never tried Dreamfield's before. I would like to try the Blackened Shrimp Pasta. We love pasta and would love to try dreamfields! We have never tried Dreamfields pasta. We do however, make a lot of pasta and I would love to give it a try. Yes, I eat Pasta, maybe too much! Dreamfields pasta is a pasta my whole family loves!! We eat pasta, but we haven't tried the Dreamfields line yet. We do eat pasta, but we haven't tried Dreamfields yet. I would like to try the Angel Hair and Tomato Toss recipe. I love past but have never tried Dreamfields. The entire family is super crazy for and begging for pasta constantly..this would be a major blessing!! I eat pasta sometimes but never heard of this one though. I love pasta but I have never had Dreamfields! We love eating pasta, have not tried Dreamfields pasta but would love to! Our family loves pasta and we eat a lot of it, but we have never tried Dreamfield's Pasta. Our whole family love pasta...make pasta dinner 3 times a week. I would love to try the recipe for Angel Hair con Tilapia! Yum! Pasta is my favorite food and I have had dreamfields pasta before thanks so much. Chicken fettuccine is good. I eat a lot of pasta, but I've never tried Dreamfields pasta. I love pasta, but I feel like I shouldnt eat it. I have never tried Dreamfields but I would love to if it makes me feel less guilty. Yes I do, and I have had Dreamfields a few times. We like pasta. We have not tried these. Yes, we like pasta and no I have not tried this. I love pasta but I have never tried this brand before. I do like pasta, but have not tried Dreamfields yet. We eat a lot of pasta, and I have tried Dreamfields before. I eat a lot of pasta. I've never tried Dreamfields before but would absolutely love to! I would love to try the Buffalo Chicken Pizza Mac & Cheese! I do eat pasta, I have never tried Dreamfields but would love to. I always loved pasta, but I've never had the pleasure of trying Dreamfields. Can't wait! I eat pasta. I have never tried this brand. I eat very little pasta and I've never tried Dreamfields pasta. Yes, I eat pasta. I haven't tried Dreamfields though. I do and i love Dreamfields! We eat a lot of pasta at my house, usually once a week. I've never tried Dreamfields before. A few recipes caught my eye that I would love to try ASAP - Asparagus and Lemon Rotini, BLT Pasta Salad and Chutney Shrimp Pasta (and I saw a lot more that look delicious and easy too - what a great site for ideas!!). I love pasta, and we have tried dreamfields a few years ago, and it was so good! We eat pasta, but I'm guessing a lot less than most. However I insisted my better half make his Alfredo from scratch last night to pair w/ our veal. I love pasta & eat it often. I would love to try the Dreamfields pasta. i eat pasta a lot but have not tried this brand! We have pasta once or twice a week, but have not tried this brand. This Blackberry Ginger Pasta Salad is unique and sounds awesome! We do eat pasta but have never tried Dreamfields. I have not yet had the opportunity to try Dreamfields pasta. I do love pasta dishes like spaghetti. Yes love pasta. Have never tried Dreamfields before. I love pasta and am all for a healthier for me option! Looks delish. I would like to try the Apple-Berry Chicken Pasta Salad recipe.